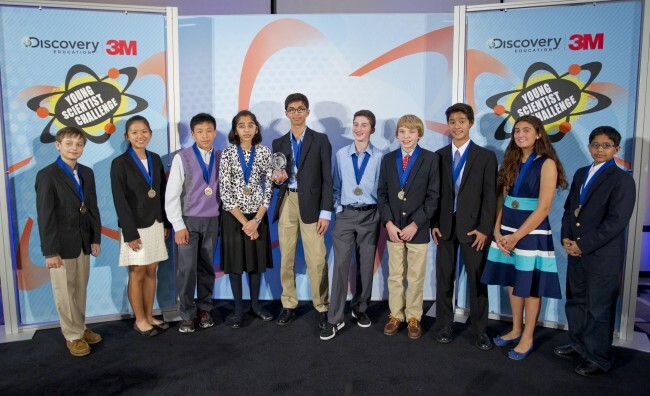 Washington, Oct 15 (IANS) Five Indian-Americans made it to the final ten in the 2015 Discovery Education 3M Young Scientist Challenge, a competition to develop scientific plans to solve everyday problems. The top prize of $25,000 and an “adventure trip” went to Hannah Herbst, 14, a Grade 8 student from of Boca Raton, Florida, at the finals Tuesday in St. Paul. She developed an Ocean Energy Probe that aims to provide a stable power source and fresh water to developing countries around the globe by using untapped energy from ocean currents. Last year 14-year-old Sahil Doshi, an Indian-American ninth grader from Pittsburgh, Pennsylvania was named America’s top young scientist for his innovative, eco-friendly battery design. Among the five Indian-American finalists this year, Raghav Ganesh, 13, a 7th grader from San Jose, California has invented a device that predicts and prevents Autistic Meltdowns to help those with Autistic Spectrum Disorder and their caregivers. Monitoring physiological and environmental factors that can cause and trigger stress, Raghav’s wireless and wearable machine alerts the wearer and caregiver when any stressors rise above a certain threshold. His invention allows care to be tailored to individuals’ needs by recording all sensory data and therapeutic responses. Raghav hopes his invention can help many people in daily situations, catering to the Autistic population and their caregivers. With a goal of preventing distractions while trying to concentrate, Amulya Garimella, 11, a Grade 6 student from Pittsburgh, Pennsylvania, has invented a distraction monitoring system that alerts the user of distraction by measuring EEG brainwaves. When users get distracted, they will receive an alert reminding them to concentrate and get back to work. Amulya hopes that being distracted while doing homework or working will be a thing of the past! Iris Gupta, 12, a sixth grader from North Potomac, Maryland, has invented a device to stop allergies at the source. She believes that by inhaling or injecting nanoparticles, allergens’ ability to attach to antibodies present in one’s body would be blocked as they entered one’s systems. Her invention aims to give people suffering from allergies some much needed relief by testing to find the correct amount of nanoparticles optimal for blocking allergens. Krishna Reddy, 13, Grade 7, from Wichita Falls, Texas, has invented a device that finds other substances that a breathalyzer for alcohol consumption cannot detect. Krishna created a pupillary reflex computer programme and apparatus that measures pupil dilation. Many drugs influence the uncontrollable movement of pupil dilation, and by detecting drugs through dilation, Krishna hopes many more preventable accidents can be stopped. Sanjana V. Shah, 13, a Grade 8 student from Cupertino, California, has created a programme to detect where cities may need more drains and where they may need to increase current drain pipe sizes to prepare for heavy rainfalls. By using pipe network analysis modelled after city drain pipe maps, Sanjana can simulate heavy rainfall to see where possible flooding may occur.